I've been to or though many Nevada towns but most visits were before I stated collecting casino chips. Since small town Nevada is one of my collecting interests I decided to visit as many establishments as I could along I-80 in the northern part of the state. On my recent trip in March 2003 I played in or visited 34 northern Nevada casinos from Wendover to Verdi. Saw the new and the old and the gone. Ended up down $30 out of my blackjack poke after six days of playing but had $117.50 face value in new chips for my collection so that part of the trip turned out pretty well also! Great weather and a few serendipitous moments. First night I stayed at Casino 93 in Jackpot. Okay motel room for $33. I like to play at Cactus Pete's, the most upscale feeling of the three full service casinos in Jackpot, a border outpost of casinos that sprang up when Idaho decided to rid itself of gaming houses. Horsehu across the street is part of Cactus Pete's but I wasn't happy with my last stay at their hotel and didn't feel either place is a good value. Atmosphere at Horshu is between Cactus Pete's and a low-key cowboy place, Casino 93,. Good discount liquor store in Jackpot if your state inflates liquor prices for state revenue. Have all the current Jackpot chips I need but I should have pocketed a very new $5 Horseshu I got at the table. The cards weren't going my way Sunday night so I decided to bet it and acquire chips I didn't have in my collection from the towns I would be visiting later. Only slot card in town is Cactus Pete's/Horseshu Plateau Club, identical card to my last, 2 years ago. Drove around Wells, having harvested enough 4-Way Casino chips the last couple of visits there. I like to drive north through Ely, Wells and Jackpot on my visits to Las Vegas. A Historic Walk along one of the streets but no gaming clubs featured there. 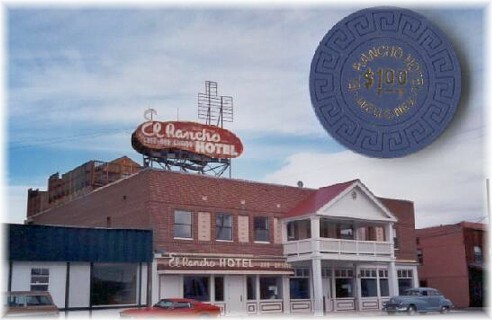 Found the El Rancho Hotel and took a pic of the large weather-beaten sign. The forlorn Chinatown casino and motel sits at the westernmost freeway access, closed after a short 1984-1988 stint. Wished I'd noted the address of Pequop Hotel before my Wells visit, I'll be back to locate that defunct arodie chip source. Elko next with a couple of places I wanted to visit. First place I saw was one of the Red Lions. Never a fan of their chips, I nonetheless sat at the Red Lion table of the trip's only sourpuss dealer. Looked down at my buy-in and found (Duh!) three different Cowboy Poetry chips! I had always admired them but completely forgot Elko was the place for this event. Scored that trio of chip goodness. Across the street at Gold Country Motor Inn I sat with four folks all wearing "Bus Patron" buttons and picked up another sought after $5 chip. Small casino, two tables, one open. Attempted to get a slot card but the machine was across the street today at Red Lion, oh well. Downtown to Stockman's, the only open downtown casino until the Commercial Hotel renovates from their fire. The guy at first base in the rodeo shirt was trying to sell the dealer a new suit "out in my car" but wasn't having much luck. Skip the Hilfinger shirt and golf course bermudas here unless you like to feel uncomfortable when you play. Justin boots and duds with the Wrangle tag would fit better. I like these kind of places and fit in mainly by keeping my mouth shut and not wearing bus buttons. Back out onto I-80 and watch the snow cloud down to the basin floor a mile south and blue sky dead ahead. This part of Nevada is at a 4000 - 5000 foot elevation, something to keep in mind during the winter months. A PA announces the Greyhound departure at Carlin's casino, slots-only at the Pilot truck stop. "Ya don't wanta get stuck here!" cackles the old gal behind the fuel counter. Would have been a great vein of info for the historians of the club, this lady. Take a tour of town, not the smallest Nevada place I've been to, but close. If I had a double-wide here, I'd be the King of Carlin. 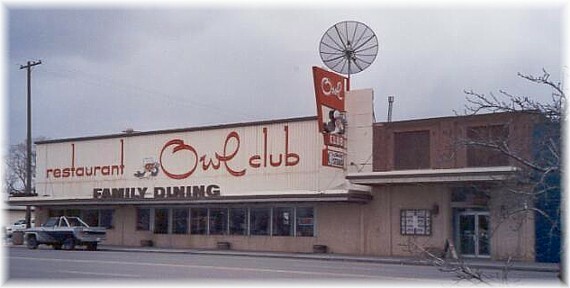 Battle Mountain, the table is covered today at Nevada Hotel but I take some photos of The Owl club next door. The sign down the road shows Battle Mountain's amusement at being named by some obscure entity, the "Armpit of America" but local drivers stop to let folks jaywalk. Winnemucca. My folks flew in on a gambling junket there a long time ago and I was pretty surprised at the small casinos in Winnemucca. Guess you were trapped at the Red Lion if you flew in. Stayed at Peterson's Model T but didn't find any of their valuable old-issue chips under the bed, darn. Played with some of the other truckers laying over while Pippy Longstockings' sister dealt and related tales of drunks, bikers and mean women BJ players. Up the street to junketville, the Red Lion. Great table of fun players and a lovely dealer. Only stick-in-the-mud was a young fellow counting cards (shh - don't tell anyone!) and losing hundreds of dollars doing it. Didn't seem to be having too much fun. I am re-reading card counter Barry Meadow's "Blackjack Autumn" and wanted to try counting the prevalent single/double deck games in this part of the state. Every game seemed to remain at -3 for the duration of the deal for me. Only increased my bet a half dozen times and usually lost but did use the count to take insurance once, rescuing $20. Count cards or use basic strategy, it helps but luck is luck is luck. Finished the night at Winners, a local type place. Legends is handy too, but didn't desire any of their chips and never stopped in. No player cards in Winnemucca. Lovelock the next morning, don't believe there is a table left at Sturgeon's and located the graveled lot where the Big Meadow Hotel and Club used to be. On to Reno via a detour to Fallon and Fernley. No tables and/or no games during a weekday morning. Plenty of people feeding the slot machines and I imagine table games will continue to fade in small town Nevada. First stop in Reno was the Alamo Travel Center, exit 22. Wanted one of their chips but they were the BTS variety so dropped a few $ and skeedaddled, looked like a good place to get into a fistfight if'n you wanted. My method of gathering chips is to play for them at the tables, I'd only buy in for $30, play a few hands and leave with a chip or two in my pocket. Just the way I like to collect. Reno Fitzgerald's didn't know who I was, internet reservation number or not. After trying to stick me in what sounded like a closet, I got a $4 upgrade that turned out to be pretty good. $28 found me in a good sized room on the 15th floor looking at Eldorado, Silver Legacy and Circus Circus. At my feet was Commercial Row and the dreaded train tracks! Since I live 7 blocks from a RR crossing and 18 blocks from tugboats whistling at drawbridges, I never noticed any trains while asleep. I wanted to try Fitzgerald's since I fell in love with several of the women dealing there when I went to Jim Fredrickson's 2002 Reno show last September. They were all on vacation this week I guess. Sigh. Lincoln Fitzgerald is also one of my favorite Nevada characters also. Anyhoo, both Fitzgerald's and the Eldorado were celebrating Give Mark Money Days! Played and won, played and won, etc.. The new Eldorado chips are very impressive in real life and worth adding to your collection. Couldn't justify keeping a black chip though. Never cared for Fitzgerald's chips but did pocket a very good example of their $25 millennium chip to go with the $5 Y2K I found on the table my last trip. Actually I had two and kept the best, I would imagine that these got booted out of the cage not too long ago. Walked into the new Golden Phoenix Tuesday at 7pm and there was NO one playing table games! Craps, roulette, and card dealers staring at me creepy. A handful of slot players. Woeful. I've been studying a lot of Reno history lately and wanted to orient myself to the old places like Harolds, the Palace and Bank Clubs, Golden Hotel and New China club. Found a good display of historic photos on the sky bridge over the tracks at Fitzgerald's. You could view old photos of Commercial Row and look right out the window at their location. The largest casino in the world at one time is a concrete plaza, one of Harrah's entrances now. Of course the Horseshoe is easily identifiable but only hobbyists would recognize which building was the Primadonna. The Money tree outlandish and shuttered, the Riverside Hotel stripped of add-on motel units, pool and casino marquee. I kept running into older dealers who had worked in some of the not-too-old but gone clubs and remembered the classic places. Never had a real opportunity to gab about those days with them though. Too bad there is isn't a display like Steve Cutler's Las Vegas collection in Reno. There was a letter-to-the-editor suggesting such a feature while I was visiting. I did discover the National Automobile Museum while in Reno, housing remnants of William Harrah's colossal collection. www.automuseum.org A very enjoyable 2 hours for me. I visited his collection in it's heyday and consider it a national resource destroyed by corporate indifference and ignorance. You could wander not only the display areas (50 Lincolns in a row!) but also poke around in sheds containing cars awaiting restoration. I stood gape-mouthed with others in a theatre at the original collection watching a movie filmed from a camera mounted low on the front bumper of a 12 cylinder Ferrari sans mufflers blasting full throttle through the early morning streets of Paris. Sliding over cobblestones and barreling down century old lanes to a lakeside park where the driver meets a pretty girl, they kiss and walk away down a path. This legendary (to gear-heads) short is titled "Rendezvous" and is hard to find and quite pricey. I'm still impressed by the movie and Harrah's cars 25 years later. I visited the antique shops at the defunct Comstock casino. A few chips at top TCR prices and casino glassware, ashtrays and such. You'd do better on eBay I believe. I did find a very nice copy of Leon Mandel's "William Fisk Harrah" for $10. No bargain but not an easy to find book either. I'm more interested in what Mandel had to say about Harrah than Harrah himself and had been casually looking for this book. Went to Tahoe on another beautiful cloudless day. Visited a few places but due to disorganization and lack of preparation, missed a couple of places I wanted to chip at. I last visited Lake Tahoe in 1966, I was 16 and uhh, it sure looks different now! Not the lake but the wide spot in the road where the casinos were located. Too bad mom didn't take any pictures and Dad wasn't going to walk off with any chip as long as he could bet it. I just hung out with my sister on the lake edge then. Very friendly place but didn't enjoy the grind of the drive to what seem to be pricey properties. Up and over a ridiculously steep grade to Sharkey's in Gardnerville. Lots of bare spots on the walls where I understand Sharkey had a lot of memorabilia. Great food. The 21 table was covered so I went back to Reno via Carson City to win some more money. Stopped at Bordertown on the way out of Nevada and scored a couple of chips and an additional $20 win. Gotta say I'll probably be considering Reno first for my Nevada visits except for that big ol'club deal we have in Las Vegas. Been reading a lot of Reno lore and there are a lot of interesting facets to the different places and people. Reno may be a more western town since many of the "stores" as they were called, were started by California gamblers, Lincoln Fitzgerald being an exception. The west has always been tolerant of gambling and this may have set a different tone in Reno. Las Vegas, of course had mob guys and also the guys out of the Midwest who had the mentality of running illegal joints. 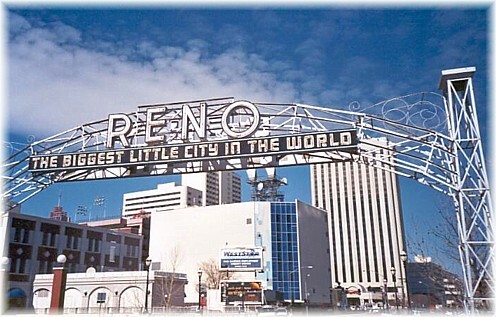 Being a wise guy and "in the know" was never very important in Reno. The classic Reno chips don't compare to classic Las Vegas for sure, but the background of some of the Reno houses sure adds a lot of appeal to that town's pieces.